Bring another gun for us to clean while you compete. We clean while you have fun! show you how your guns can look after our ultrasonic cleaning process. We will be appearing during the Steel Challenge at Belton Gun Club on Sunday, April 24th, ready to clean your dirty guns! LET US SHOW YOU WHAT OUR CLEANING AND LUBRICATION PROCESS CAN DO FOR YOUR GUN. Our Cleaning and Lubrication process takes approximately 30-45 minutes for a handgun, 1 hour + for long guns. Drop them off with us, enjoy Sharpshooters, or just run your Saturday errands! We are licensed and insured. We work while you play! Mention you’ve seen us on Facebook, Instagram or our Website to get $5 off any cleaning! LET US SHOW YOU WHAT OUR PROCESS CAN DO FOR YOUR GUNS! Unfortunately, our appearance at Cherokee Gun Club has been temporarily postponed, but will be rescheduled at a future date. Please continue to check back for more information. In the meantime, please check out our other events. Come by and let us show you what ultrasonic cleaning can do for your weapons. We are coming back to Skip J every 1st Saturday during the IDPA Match. Bring another gun for us to clean while you compete! Let us show you what our ultrasonic process can do for YOUR gun! 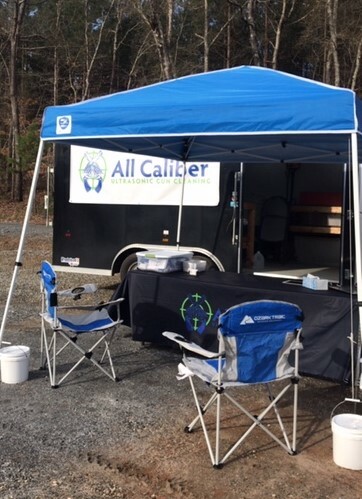 All Caliber Ultrasonic Gun Cleaning is proud to support the SCYSF during the 2019 Sporting Clay Tournament Series at Clinton House Plantation. Drop by our mobile trailer and let us show you how our ultrasonic cleaning and lubrication process can bring your guns back to great working order!